I think I'm still in denial that it is already August. How is it that time just goes by faster and faster and faster, I don't think any of us would be complaining if it just slowed down for a second. 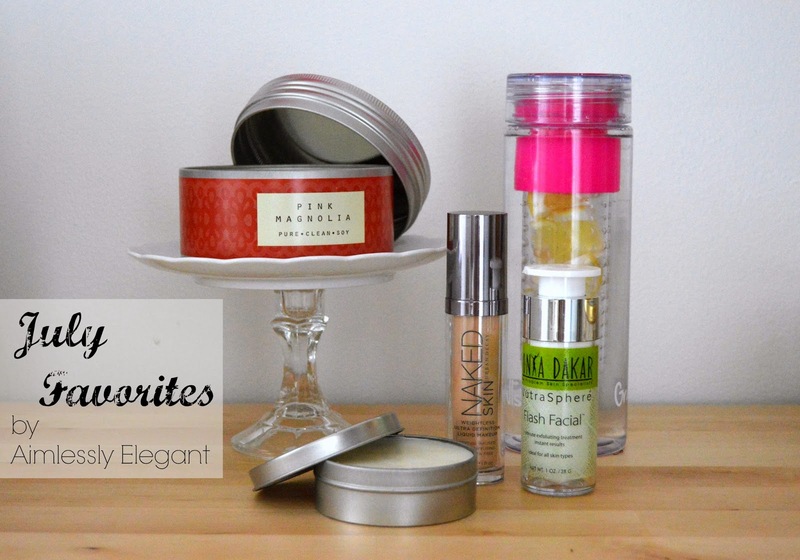 Since another month is behind us I have rounded up a couple of products that I have been loving this last month. I am in love with the scent of this candle. I first discovered it last summer while strolling the candle isle at Target, I quickly burned through one and immediately went back for more. Then I seemed to put the lid on and forget about it, until a few weeks ago, when it was rediscovered, and of course I then had to go back for more. The scent is so fresh and feminine yet not overpowering, there is something about it that reminds me of an old perfume I used to wear. It's a perfect scent for summertime. Now I use lotion bars all the time, and I've always thought they are one of the best inventions ever, but there is something about the ease of them in a hot summer month like July that makes them a little more relevant. I love that I know exactly what I am putting on my skin, and it's so easy and quick after a shower to smooth over your body. It keeps your skin hydrated and moisturized without feeling heavy or sticky which is super important when it becomes hot and humid out. Not that we've experienced much of that this summer, which is still pretty unbelievable to me! This was the one product I was actually hoping would not make it on my favorites list, because it is $95!. I got this product in my summer FabFitFun VIP box and I can easily say I myself have never ever spend $95 on a single skin care item. But now I can say I'm seriously contemplating it. This stuff is quite amazing. It's a clear gel that you smooth over your skin, then after 1-2 minutes you massage it off and it buffs off dead skin. I used it a few days in a row and after about the third day I noticed how fresh my skin looked and felt. There were no dry flakes or pealing areas and my skin was so smooth, I could tell the difference in how my foundation went on. After using it a few days in a row I started using it every couple days in hopes of getting the most out of it that I can. Will I buy it again? The answer isn't a definite no. Right now it's on Amazon for $75, which is about the cost of a facial when you go to a salon, and this bottle has a ton of mini facials. See there I go trying to justify it, we'll see what happens when I run out! Ok, I know in last months favorites I talked about the new Bare Minerals liquid foundation, and now here I am with a different foundation in my favorites. The Urban Decay Naked Skin foundation is what I was using before I tried the Bare Minerals. Now, while I still like the new Bare Minerals liquid foundation, Urban Decay's Naked Skin is definitely my most favorite foundation. To me it has little to no odor at all, which I like. It also stays put pretty flawlessly all day long, but you can't even tell that you have it on. I feel like with the Bare Minerals you feel like you're wearing foundation, not so with Urban Decay's Naked Skin. Once you put it on it seems to disappear on your skin and keep you looking fresh all day long. This is another item I got in my FabFitFun VIP box and I have been using it almost every day since I got it. It seems like I am always on a mission to drink more water. I know that I should, I know that it's good for me, but I never seem to drink nearly enough. Adding a little flavor to it totally helps, and the great part is even after refilling it several times it still infuses a lot of flavor into the water. I haven't gotten to crazy yet with any flavor combinations, my go to tends to be raspberries and lemons, but maybe I'll have to start experimenting with some other options. I'm addicted to candles! I usually just buy the Bath & Body Works 3-wick candles, but I'll definitely check this one out next time I'm at Target! These are great picks! I've always wanted to try the UD foundation - I think you've convinced me to at least go get a sample to try out. The Bath & Body Works 3-wick candles are pretty great! My favorite is in the winter, I think they always have the best Christmas tree scent! You should! I have tried a few other foundations since I've started using the UD and I always go back to the UD!